Dixon is a city and the county seat of Lee County, Illinois, United States. The population was 15,733 as of the 2010 census, down from 15,941 in 2000. The city is named after founder John Dixon, who operated a rope ferry service across Rock River, which runs through the city. 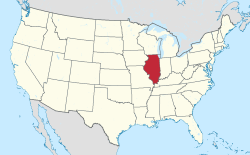 The Illinois General Assembly designated Dixon as "Petunia Capital of Illinois" in 1999 and "The Catfish Capital of Illinois" in 2009. Dixon is the boyhood home of former U.S. President Ronald Reagan. The city is also the site of the Lincoln Monument State Memorial, marking the spot where Abraham Lincoln joined the Illinois militia at Fort Dixon in 1832 during the Black Hawk War. The memorial is located on the west side of Dixon's main north-south street, Galena Avenue, (U.S. Route 52, also Illinois Route 26), north of the Rock River. Around 1828, Joseph Ogee, a man of mixed French and Native American descent, established a ferry and a cabin along the banks of the Rock River. In 1829, an employee of Ogee was named postmaster at the newly constructed post office. John Dixon, the eponymous founder, bought Ogee's Ferry in the spring of 1830 and brought his family to his newly purchased establishment on April 11 of that year. Shortly after, the name of the post office was changed to Dixon's Ferry. Running by Interstate 88 is a road named Bloody Gulch Road. The road is named after a murder and body disposal. On September 12 1885, two young men walked along a county road south of Dixon, one a farm hand named Joseph M. Mosse and the other, Frank C. Thiel, a traveling salesman from Elgin, IL. The unemployed farmhand told the salesman of a place he could sell his Bibles and proceeded to take him to a farm where he had worked. As the two men passed a gulch the farmhand struck and killed the salesman with a knife and a walnut baluster he was seen carrying under his arm. He then buried the body in the culvert. The body was later discovered when cattle refused to use the underpass en route to a milking barn. An overnight rain had washed away some of the dirt exposing a limb. When the sheriff arrived to question the farm hand, since he was seen leaving Dixon with the deceased, he pretended to get a drink while throwing a watch chain taken from the salesman in the bushes. The evidence was found and the farmhand was eventually put in jail for life, while the road over the underpass began to be called Bloody Gulch Road. In April 2012, Dixon Municipal Comptroller Rita Crundwell was indicted by a Federal Grand Jury for embezzlement. She used the embezzled funds to pay for her lavish lifestyle and what became one of the nation's best-known quarter horse-breeding programs, among other things. Crundwell's crimes, thought to be the most substantial municipal theft in U.S. history, impacted Dixon's finances severely. Federal prosecutors estimated the amount embezzled at $53 million since 1990. The city sued the auditors who had failed to detect the embezzlement and the bank at which Crundwell maintained a secret account, and received $40 million in settlements. In February 2013, Crundwell was sentenced to almost 20 years in prison. Dixon is the boyhood home of the 40th President of the United States, Ronald Reagan. Reagan was born in nearby Tampico and moved to Dixon, aged nine. In his teen years, he lifeguarded along the banks of the Rock River. His family house is preserved at 816 South Hennepin Avenue, and authorized by Congress to become the Ronald Reagan Boyhood Home. In 1984, during his first term as president, Reagan returned to Dixon to celebrate his 73rd birthday. He toured his boyhood residence and the city held a parade in his honor. As of the census of 2000, 15,941 people, 5,681 households, and 3,488 families resided in the city. The population density was 2,519.8 people per square mile (972.3/km²). The city consisted of 6,138 housing units at an average density of 970.3 per square mile (374.4/km²). The city's racial makeup included 86.33% White, 10.48% African American, 0.14% Native American, 0.82% Asian, 0.05% Pacific Islander, 1.10% from other races, and 1.09% from two or more races. Hispanic or Latino of any race comprised 4.30% of the population. Of 5,681 households out of which 29.8% had children under the age of 18 living with them, 45.7% were married couples living together, 11.8% had a female householder with no husband present, and 38.6% were non-families. 32.6% of all households were made up of individuals and 14.7% had someone living alone who was 65 years of age or older. The average household size was 2.32 and the average family size was 2.94. The median income for a household in the city was $35,720, and the median income for a family was $45,088. Males had a median income of $32,511 versus $21,777 for females. The per capita income for the city was $16,630. About 5.7% of families and 10.1% of the population were below the poverty line, including 10.7% of those under age 18 and 12.0% of those age 65 or over. Dixon is a regional employment hub and is part of two fast growing distribution and warehousing and food processing districts: one is I-88 West and the other, the I-39 Logistics Corridor. The biggest industries are healthcare and government. Healthcare employs over 1,700, while government jobs approach 1,500. The Dixon Correctional Center employs over 600 workers, as does the Department of Transportation. KSB Hospital has nearly 1,000 employees. Dixon has many industries employing thousands of the region's residents. The largest are Raynor Garage Doors, Donaldson Inc., Borg Warner, and Spectrum Brands. Fifteen miles away in Ashton, Crest Foods employs over 600. Every summer Dixon holds the annual Petunia Festival featuring a parade, carnival (Farrow shows), country concert, fireworks show, and a 5K race—the Reagan Run. The parade features a multitude of floats from surrounding businesses, politicians, and other area groups. A carnival is also held in Dixon during this time, and the festival ends with the Fourth of July fireworks. The Downtown district has become a National Historic District. The Rock River which runs through the center of Dixon has been designated a National Waterway by the Federal Government. Dixon residents have supported a variety of large-scale projects that have created several aspects to their rural community. One aspect of this small town is that an individual can kayak the Rock River to the city's downtown docks and join a public Yoga session on the riverfront. The Dixon Park District owns more than 1,100 acres (450 ha) of land including two historic parks platted in 1842. The parks range from Lowell Park's 200 acres (81 ha) which is listed on the National Register of Historic Places; rural Meadows Park which encompasses 567 acres (229 ha) of recreational opportunities with natural areas and farm land; to neighborhood parks located throughout the city. Lee County, of which Dixon is the County Seat, offers many recreational areas and campgrounds; over 7,000 campsites are located within 17 miles of the city. Tourists from nearby Chicago take advantage of Lee County's recreational opportunities, particularly during summer weekends, adding approximately 20,000 people to the area's population. Rita Crundwell: breeder of quarterhorses; embezzled approximately $53 million while Dixon comptroller in what is believed to be the largest municipal fraud in American history. John Dement: 19th century politician and military commander. John Deere: industrialist, manufacturer, invented first commercially successful steel plow; born in Vermont, lived in Grand Detour. John Devine (cyclist): professional bicycle racer. John P. Devine: Speaker of the Illinois House of Representatives. Sherwood Dixon: politician, 36th Lieutenant Governor of Illinois. James K. Edsall: politician, Illinois Attorney General. Samuel Cook Edsall: Episcopal Bishop of Minnesota. Daniel G. Garnsey: United States Congressman. Jerry Hey: five-time Grammy winner. Jeanie Linders: writer and producer of Menopause: The Musical. William H. McMaster: South Dakota state representative, state senator, lieutenant governor, governor, US senator, later banker in Dixon. Ward T. Miller: professional baseball player in early 1900s for Pittsburgh Pirates, Cincinnati Reds, Chicago Cubs, St. Louis Terriers (FL) and St. Louis Browns. Louella Parsons (born Louella Rose Oettinger): influential newspaper columnist; born in Freeport and grew up in Dixon. Ronald Reagan: 40th President of the United States, 33rd Governor of California, noted actor; born in Tampico and grew up in Dixon. Rondi Reed: Tony Award-winning actress and singer. Charles Rudolph Walgreen: founder of drugstore chain; he grew up in Dixon and began his career there as a pharmacist. ^ a b "History of Dixon". Dixonil.com. Retrieved 2015-07-28. ^ "Google Maps". Maps.google.com. Retrieved 2015-07-28. ^ "Bloody Gulch Rd, Dixon, IL 61021". Google Maps. Retrieved 2012-09-06. ^ "Bloody Gulch Road and Early Justice". Lee County Historical Society. Retrieved 2012-09-06. ^ McDermott, Kevin (November 2012). "Big theft, little city: Dixon's former comptroller is accused of stealing $53 million from Ronald Reagan's hometown". University of Illinois Springfield. Illinois Issues. Archived from the original on 2014-05-28. Retrieved 5 June 2014. ^ a b Jenco, Melissa (15 February 2013). "Ex-Dixon comptroller gets nearly 20 years for theft". Chicago Tribune. Retrieved 5 June 2014. ^ "Feds: Illinois city official actually stole $53M". CBS news. 2 May 2012. Archived from the original on 4 May 2012. ^ "$54M Dixon theft now subject of college courses". Chicago Tribune. April 18, 2015. ^ Babwin, Don (2013-02-14). "Former Dixon bookkeeper who stole $53M gets nearly 20 years - News - Journal Star - Peoria, IL". Pjstar.com. Retrieved 2015-07-28. ^ Grinberg, Emanuella; Watts, Amanda (May 17, 2018). "This officer stopped a school shooter before anyone got hurt". CNN. Retrieved November 27, 2018. ^ Wall, Craig (May 30, 2018). "Dixon police officer who prevented school shooting honored". ABC7 Chicago. Retrieved November 27, 2018. ^ "The Ronald Reagan Trail: Welcome to Dixon". Archived from the original on 6 December 2013. ^ "Reagan celebrating 73rd year with visit to his boyhood home". Spokane Chronicle. Associated Press. 6 February 1984. p. 6. ^ "Dixon Petunia Festival - Official Website". Petuniafestival.org. 2015-07-05. Retrieved 2015-07-28. ^ "History". Dixon Petunia Festival. Archived from the original on 26 November 2013. ^ "Things To See". Dixon, Illinois. Archived from the original on 17 August 2012. ^ "John Deere Historic Site - City of Dixon Illinois Official Website". Discoverdixon.org. Retrieved 2015-07-28. ^ "Dixon History | General | About Us". Discoverdixon.org. Retrieved 2015-07-28.